It's halfway through November, which means it's pretty much already Christmas! If this fills you with childlike joy then congratulations, you're in the right place today. Hell, even if this stone cold fact fills you with despair or has no influence on your emotions at all then I still think you're gonna enjoy Celestial Cosmetics' offering for Xmas 2016. 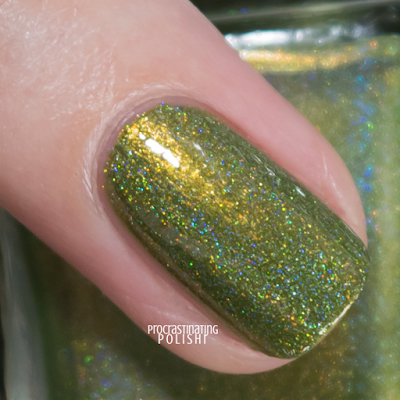 A slightly dirty mid-green holo with a golden orange sheen. Do I even need to say how much I love it? 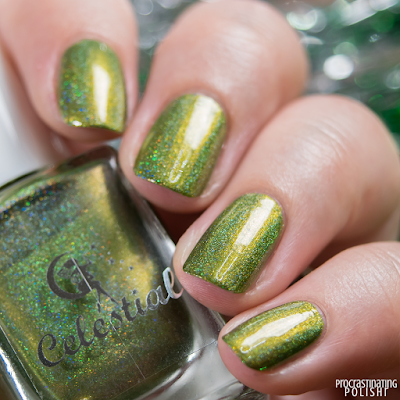 It's bold and unique, green and sparkly all up in yr face! This has a smooth and easy to use formula, on the thin side but in a good way. I like my polish rich and deep so my swatches show 3 coats (I'm a hopeless one-more-coater), though it was opaque in two coats. 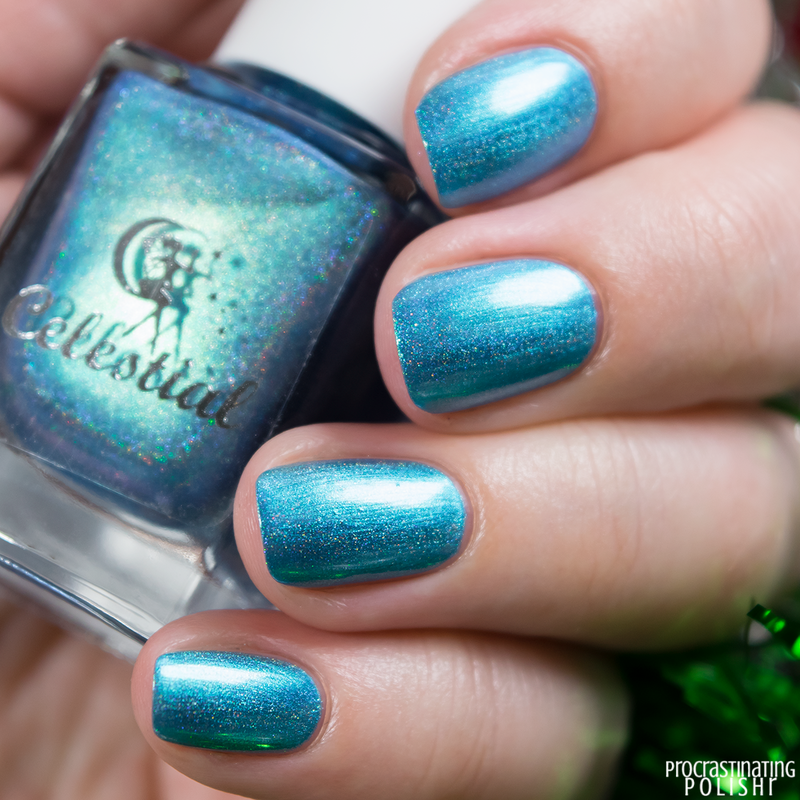 Teal jelly with holo micro glitter. Don't let my dull sounding description fool you, this baby has some blinding sparkle! It photographed a little bluer than it appears in real life - one of those pesky borderline colours. This looks like crushed jewels on your nails, there is so. much. sparkle! 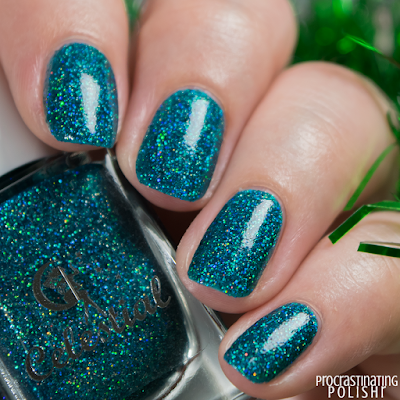 I really liked the formula of this one, perfect for floating on the nail with the glitter spreading easily. I used 3 coats for a nice opaque coverage and topped it off with a good thick top coat for a glassy finish. 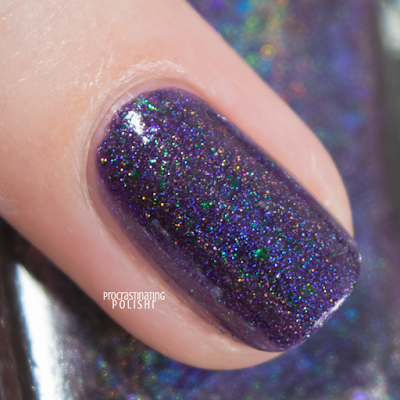 Royal purple linear holo with colour shifting flakes. Isn't it divine?! Such a rich and saturated colour with rainbows coming from every angle. 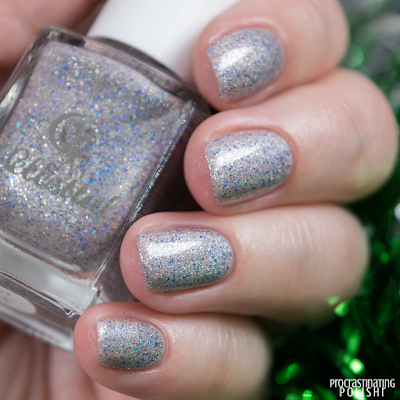 The holo is perfectly balanced and the flakes are generous without overwhelming the finish. I only needed 2 coats here, and was again impressed with the formula. Application was effortless and it dries down beautifully smooth. You really do need this! Silver holo micro glitter with blue holo glitter. The most overtly 'Christmas' shade in the collection yet still totally wearable year round. The holo plays off the cool tones beautifully and it feels like a really flattering shade. Unsurprisingly the formula was great, easy application and a nice spread of glitter. I did 3 coats for my swatch and topped it off with a glossy top coat. 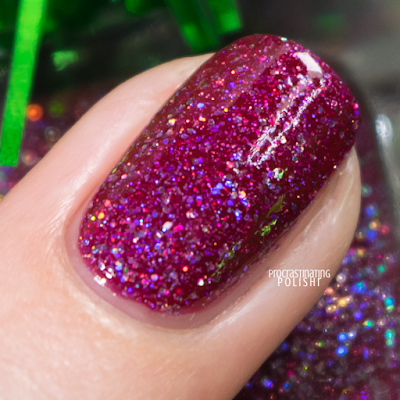 Sweet raspberry jelly full of holo and iridescent micro glitters. 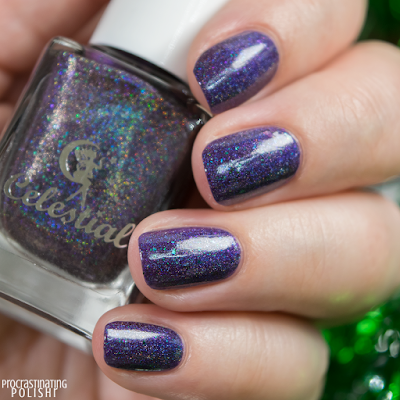 Such depth in this beauty, the combination of holo and iridescent glitters gives an extra complex juicy finish. I'm completely enamoured - the blue iridescent glow leaves me gagging! I chose to use 3 coats for my swatches as it really amped up the depth and gave a really rich raspberry colour, but it's still quite opaque at 2 coats, just a little lighter. Formula was again great. I topped it off with a regular fast dry top coat. Icy blue holo with a hint of gold shimmer and a slightly metallic finish. I say icy blue, but it actually makes me think of the blue of fire burning at a really high temperature. Either way, it's a totally seasonally appropriate shade for both summer and winter! Swatch shows 3 coats, and guess what? Great formula, again! I was concerned after the first coat that it might be a little brushstroke-y but it smoothed out really nicely. Overall I adore this unconventional take on Christmas. It's a nice mix of finishes and shades that work outside of the holiday season. Plus how can you go past those brilliant names?! 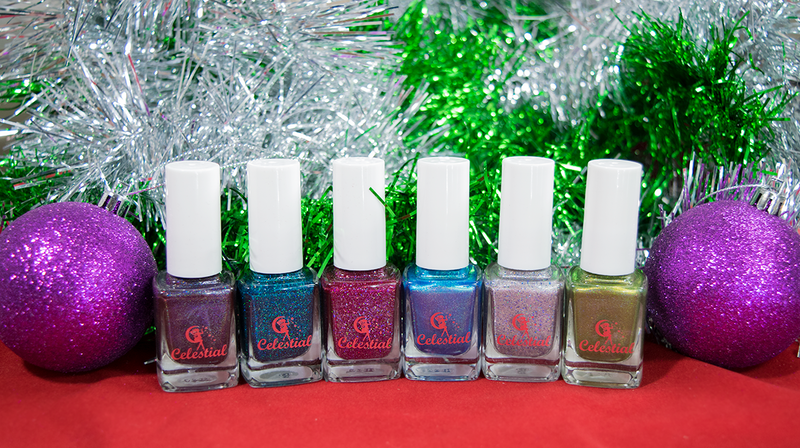 The SantaMental collection will be available from Celestial Cosmetics Sunday November 20 at 9am ACDT - click here to find your timezone.